I thought: “hey thats it! Just put the logs into solr!” So I coded something which simply reads the log files and named it Sogger. Without sharding, without message queues, … but it should work on real systems without any changes to your system (but probably to sogger). 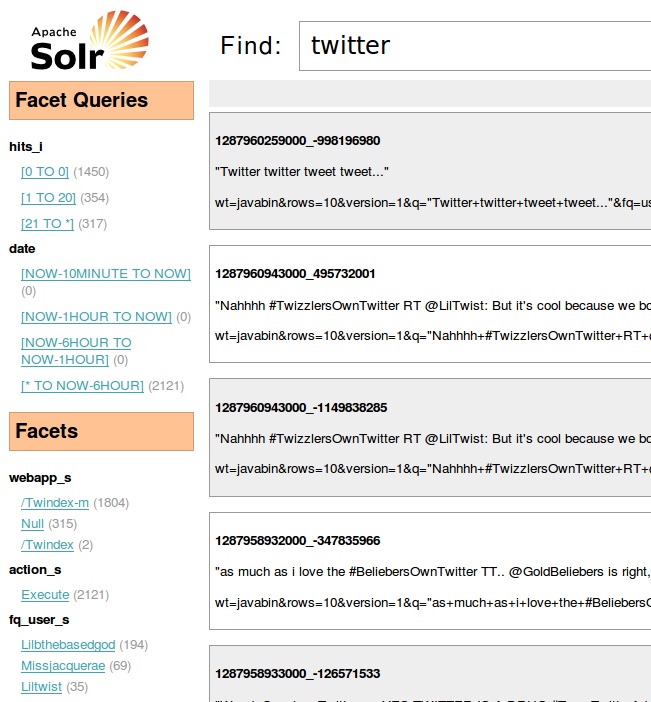 Download the Solr from trunk. open source: you can change the feeding method I used and take care of your special needs. Tell me if you need assistance! besides text files sogger accepts and detects compressed (zip, gzip/gz) files ala zgrep. So you don’t need to change your log handlers or preprocess the files. make it a solr plugin via special UpdateHandler? a xy plot (or barchart) in velocity for some facets or facet queries would be nice. Something like I had done before with wicket. I don’t like velocity … althought it is sufficient for this … but should we use wicket! ?